The aloe vera plant is an amazing skin food. It is packed with skin healing and anti-inflamatory properties, which makes it my favorite skin product. All you need to do is get your hands on one aloe vera leaf and extract the gel from it. The process is very simple. Just take your leaf and wash it, peel it, dice it, and store it in the fridge. 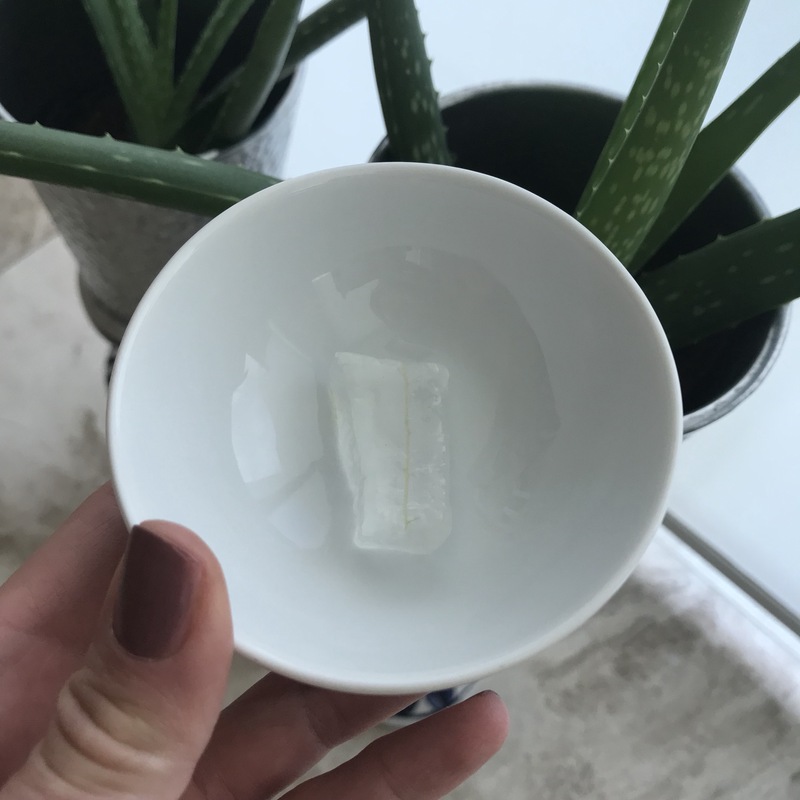 I like to squeeze a small aloe cube on my palm and then spread the gel all over my face after cleaning and toning. There is no need to wash it off as it dries fairly quick. It leaves your face smooth and lightly moisturized. It is the best face primer I have found, plus it is completely natural. You can use it everyday to keep your complexion smooth and clear. Most babies are already in a head down position between weeks 32 through 38. Only a mere 3% to 4% of babies do not turn. Mine must be special because she fits in this tiny category. So what is a mom to do when her birth plan was to follow a natural delivery? Well, best to keep the hopes high as there are indeed a couple of things you can try to flip your stubborn little muffin. Cold and hot presses. This is a very simple technique you can manage to do a couple of times a day at home when you feel your baby is active. Just go to your freezer and grab that bag of peas you never got to cook and place it on the top of your belly, where your baby’s head is supposed to be resting. At the same time, you can place a hot towel on the bottom of your belly. Stay in this position for a couple of minutes. The idea behind it is that the baby will try to move away from the cold and go to the warmest place. Music and light. You can try playing music to your baby by placing your ear-buds on the bottom of your belly. Same thing you can try with a lantern. Your baby may want to get closer to either the music or the light. As in the previous technique, do this when your baby is active. Yoga headstands and pelvic tilts. Yoga headstands are believed to help turn a breech baby within24 hours. For your safety, and that of your baby, do them with the assistance of a licensed yoga practitioner. Pelvic tilts are very safe and you can do them anytime around the house when your baby is active, and your stomach empty! Try to keep the position for as long as you can, up to 10-15 minutes. Another position is to walk on your knees around the house. Hypnosis. You may download a hypnosis mp3 and listen to it whenever you have a time to relax. Listen to it at least once a day. The hypnosis session will help you connect to your baby and hopefully help him or her to turn. Homeopathy. If you would like to try homeopathy to help your baby turn, then you can take around 200c of Pulsatilla. Pulsatilla will aid your uterus to grow more evenly so that your baby has more space to turn. Always consult a midwife or doula before taking any homeopathic medicine. Moxibustion. OK, here we start getting a bit more complicated. Moxibustion is a very ancient technique employed in Chinese Medicine, which combines Acupuncture and the use of Moxa. Moxa is a cigar shaped stick containing the herb mugwort. The Acupuncturist will stick a needle in each one of your pinky toes and then will burn the Moxa stick close to those acupuncture points. The heat will then stimulate these points and help your baby turn. Success rate is believed to be between 69% and 85%. ECV (External Cephalic Version). This is the last procedure you would like to attempt, as it is painful and can result in the rupture of the amniotic sac, sending you to labor. It is usually performed after 36 weeks, and it must be done by an experienced doctor, while under constant fetal monitoring. Success rate is very high, around 65%, although some babies manage to turn back into a breech position after the procedure. So there are many things you can try before giving up on your breech baby. Also, it is important to note that some babies have been reported to turn head down on the day of delivery. So good luck on that muffin! So where is “The Glow“? During the first trimester of both of my pregnancies my skin turned its back at me. I was breaking out in the most unusual places of my face. It looked more as if I had a bad rash than a case of acne. Frustrated, I started trying all of those organic and natural lines recommended for pregnancy, but my skin still got worse. The issue was that I was suffering from acne due to my hormones, so I needed something that would actually treat the problem while my hormones were out of tune. I had to find safe ingredients for my sensitive oily skin. I was then able to get rid of my acne, plus I got a great glowing skin thanks to the Glytone products :)!! !